These curvy enclosures from Orb Audio certainly look the part, but do they sound good, too? Orb Audio describes itself as a 'high-end manufacturer', which subscribes to an 'innovative direct business model'. The model in question is direct sales from manufacturer to end user, bypassing the traditional retail chain, and the inevitable cost mark-ups that this involves. Specifically, Orb claims that the system sampled here, which currently appears to be its only product, though it is available in various versions, ranks above many speaker systems that retail 'north of $2500'. Also that direct sales cuts at least 50 per cent off the manufacturer's suggested retail price, while delivering higher performance and 'white glove' customer performance – whatever that is when it's at home. Orb makes additional claims for its direct sales operation, too, which it say allows it to use the highest-quality components and expensive handmade materials while simultaneously keeping prices in check. The question is, of course, can these claims be justified? There are several statements on the Orb website that don't stand up to scrutiny. The general one, that the brand is high-end, just isn't so, when based on any meaningful definition of the high-end. More specifically, the so called digital hybrid amplifier used in the subwoofer is not digital at all. It is a variant on the Class D theme, but the letter D as used here is simply the next letter in the alphabet after A, B and C, and doesn't imply digital. It is an analogue topology, albeit cool running. Another claim, that the satellites don't use crossovers, is true enough, but disingenuous. There is no crossover because there is no tweeter to share the acoustic load. Also the so-called 'full-range', 3in driver is certainly not full range, because it doesn't cover the full range of audio frequencies (generally taken as 20Hz-20kHz) at any usable level. As a system, the subwoofer takes care of the low frequency heavy lifting, but the treble is limited by geometry of the satellite drive unit. Even the more basic claim that Orb's marketing model is innovative should be taken with a pinch of salt. 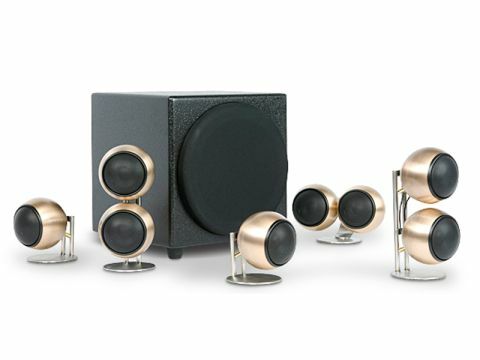 A number of speaker makers over the years have ploughed the direct sales furrow, of which the best known currently is German manufacturer Teufel, which offers a much broader range of models over a much wider range of price points. The savings from buying a speaker through the traditional retail channel is real enough in principal, but again the devil is in the detail. The system reviewed here is attractively priced, and you do get some protection by taking advantage of the maker's 30-day no hassle home trial. This means you can decide whether you like them, and whether to return them, which can be for any reason or no reason at all. This is currently at the user's expense, though Orb is setting up a UK office which can be used for returns. Shipping to the UK in the first instance is reasonably priced – $45 per pair of satellites, $200 for a full system with subwoofer plus tracking and insurance. You can find out more by emailing support@orbaudio.com, which promises a response within hours. Not too many, hopefully. For this review, HCC was supplied with two satellite models and a subwoofer. The satellites are closely related: the MOD1 is a single enclosure model fitted with a single drive unit in its diminutive spherical housing, supplied with a simple steel desktop support. The MOD2 consists of two of the above stacked vertically or horizontally (the latter is better adapted to the centre channel role), which are fitted to a taller or wider version of the support. A key benefit of the design is that it is modular – MOD1 can be upgraded to MOD2 simply and economically. A heavy floor stand is also available at extra cost. There are two compact subwoofers too, one based on an 8in driver (tested here), the other a similar design based on a 10in unit, housed in a slightly larger enclosure. The subwoofers look very similar to a number of other designs, from REL, for example. And if you think you've seen something similar to the MOD1 in the past, well you have. It's from Anthony Gallo, whose speakers are visually similar and indeed much more expensive. In fact, the two brands are related: one of the Orb co-founders, Gary Pelled, was also a partner in Gallo Acoustics, and they are clearly working from a similar aesthetic blueprint, though technically and sonically, the designs are miles apart. The Orb MOD 1 satellite consists of a single spherical enclosure made from steel with a brushed finish in most of its versions, though a range of alternative finishes and colours are available. The spheres are just over four inches in diameter and house a single 3in drive unit. Wiring hooks up via spring clip terminals rather than 4mm plugs, which are easy to use with modest gauge bare wires, but which preclude using 4mm plugs. The audio performance of Orb's system is interesting, and largely positive, though it is hard to accept that the satellites and the subwoofer were designed by the same team. They don't just look at odds with each other, they are voiced quite differently. In fact, this is a concealed compliment for the subwoofer, which is surprisingly deep and tuneful, with a fluid quality that is missing from many apparently similar designs. The satellites, of course, dominate the picture sonically, and there are some good features to be highlighted here, though my final judgement is mixed. On the plus side, both versions of the satellite are bold and detailed. There's plenty of presence and sparkle, but the balance is very mid dominant. The upper bass and lower midrange are lean and dry, while the upper midband has a rather sharp, aggressive feel that may not wear well for all listeners. The upper treble doesn't really exist – overtones of the midrange tend to dominate. This overall effect can be a tad tiring, and doesn't really pass muster as neutral. However, in its favour the system can be driven to surprisingly high volume levels without breaking up, and the warm balance tends to suit high-octane film soundtracks. It certainly did justice to the likes of Kill Bill or Quantum of Solace. Choosing which version of the Orb system to go for is not entirely straightforward. The single and dual version of the satellite sounds very similar. There is no extra bass from the larger model, which is limited to a moderate increase in the maximum volume level, less distortion under full throttle drive but the same slightly aggressive quality and trademark clarity. The satellites look wonderful, but the subwoofer is much more agricultural in appearance. There are some stunning finishes for the sats, including antique copper – a personal favourite – though the cost of the hand-finished specials is significantly higher. Orb suggests strongly that the smaller subwoofer will suffice for most systems as long as the room is not too large, but it will advise on this, and other system related issues, if required.